Where is the Dog Whisperer when I need him? so innocent, so fluffy, such a little lover! Yes, this is Argyle at one year old–and he is all of those captivating adjectives and more. Before Argyle came to live with us at 8 weeks, we diligently watched each episode of The Dog Whisperer to learn important training tips to ensure we raised him in a calm-submissive manner. After all, we messed up a lot with our first dog and we didn’t want to repeat those mistakes. To reaffirm our new-found knowledge, we also invested in several of Cesar Milan’s books and found them to be quite helpful. And just as Cesar taught us, Argyle walks perfectly, comes when we call, sits nicely while being groomed, doesn’t bark, sleeps in his crate and does everything a good calm submissive dog should do, with one primordial exception. Beneath that downy white exterior and shiny sable nose lies the masticating mechanism of a pit-bull. 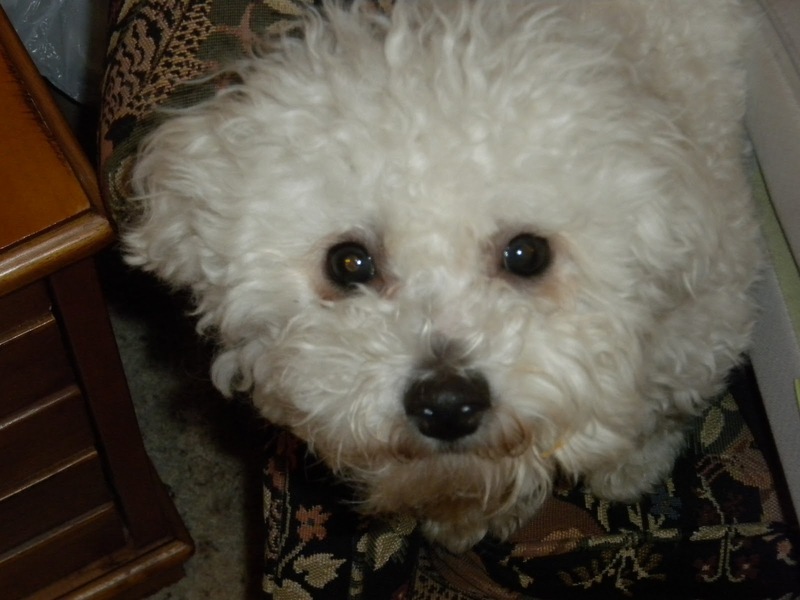 For some reason, our Bichon Frise who has never met a shoe he didn’t love, is convinced that he is either a pit bull or a labrador, because truly, he has jaws of steel. This dog gnaws everything to oblivion and I mean everything–toilet paper, the little white caps at the base of the toilet, shoes, slippers, rugs, dryer sheets, paper, books (including yours, Cesar! ),–it drives us nuts. We have gone through nylabones, rubber balls, kongs, stuffed toys, squeaky rubber toys, rawhide, pig ears, Frisbees and knotted ropes–each met with the same quick death. Out of desperation, we graduated to toys designed for much larger dogs–think Dino the Dinosaur sized toys and chews–yup, within minutes, they were history too! Finally, I bought those stinkin’ bully sticks and when I say stinkin’–have you ever inhaled after ripping the plastic off one of those? It isn’t pretty, folks. The odor is a cross between a fresh cow pasture and an overflowing litter box. But, because bully sticks are recommended by Cesar, we held our noses, shelled out the seven bucks and bought one. Of course we listened to the expert when he said that this is perfect chew for a dog and would easily last six months. Who are you kidding, Cesar? You have not seen the likes of Argyle, aka Jaws. This pit bull wannabee can chew through one of those in 20 minutes! I have no idea what we will do for Christmas decorations this year. Surely, the 12-foot tree is not going up with this chewing magnet around. I can just see it now–three a.m. visits to the vet for xrays to find out whether he swallowed the antique hand blown glass Santa Claus ornament that suddenly went missing, or gee, what happened my Scarecrow ornament from the Wizard of Oz collection? No thank you, this year, if the decorations can’t be bolted from the wall, or hung from the ceiling they are not going up. As it is, we are living quite spartan lives because anything that is not nailed down is history–yeah, we used to have wall paper in the kitchen–in fact, we used to have walls–now they have assumed the characteristic of a large wedge of dehydrated swiss cheese. Where are you now, Cesar? Do you have any advice- because we are running out of furniture and he has been eying my husband in a strange way of late.